Choosing the best gear can be a mighty task! We're continually evaluating what gear we travel with because we want to be as light and as nimble as possible. Although, we also want to be practical and carry the essentials, both for living and working. It's a delicate balance between necessity, convenience, and practicality, since we want to minimize the weight and volume of our packs. We've traveled long-term since 2016 with a single travel backpack (carry-on bag). We each started with a full 36L bag at about 20 pounds, but we now have plenty of room to spare in our pack and have dropped about five pounds each. There were travel items we thought we needed that we actually didn't and other travel items we've picked up along the way that we now consider essential. As a couple, we have gear we share (e.g. various toiletries and electronics), gear in common (e.g. laptops, daypacks), and unique gear (e.g. makeup, hair trimmer) we carry. Read on, section by section to see it all, or use our quick links to jump ahead to a specific category. Note: Items that we only need one of and share between us, are split between our packs to even out our volume and weight. We started with a travel towel for each of us, but quickly realized that because of the way we were traveling, from house sit to house sit and interspersed with hotel stays, we never actually used them. This isn’t to say we won’t pack them in the future when we do more overnight stays in locations that don’t provide us with towels. With that being said, if we did pack a travel towel, we’d use the Packtowl Ultralite Soft Texture Towel, although without the carrying case. We find it unnecessary to pack a drain stopper, as we can easily wash our clothes in the shower, plug the sink with the built in plug, or make our own plug with a sock or plastic bag. Additionally, we use a two-gallon Ziploc bag to isolate dirty clothes, and it also doubles as a portable washing bag! It’s been suggested that a head lamp is a good idea to pack, but since we don’t do much night hiking, we haven't been in a situation where our phone's LED Flash Light App hasn't been enough for short amounts of time. Plus, we clip-on a small LED light to make us more visible when walking and to light up our path at night. Some gear and packing lists suggest bringing a travel clothesline with you, however we’ve never had a need for it. We simply get creative where we hang our clothes, like from/over a chair, lamp, door, picture frame, etc. (with caution of course, be careful not break or damage anything, including via dripping water!). We were leaning towards not using cubes at all, but really liked the idea of organizing our packs with them. So, when we got the idea to use Ziploc bags instead, we ran with it. We initially reinforced them with packing tape and they worked well! 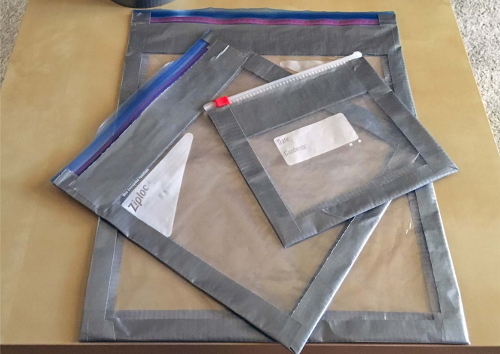 Although, after a year of constant use, we had to replace several of the bags and learned that only a few bags (that carried heavier and sharp objects) needed to be reinforced with packing tape. Additionally, since our bags are round-ish, if we filled them with square bags, we’d have a lot of wasted space. We address this by only using our DIY packing cubes for some of our stuff (smaller items), and the rest (larger items) we pack loose to fill in the empty space. We only pack a couple of shirts, so they need to be comfortable for all of our activities. Plus, since we often hand wash and hang dry, we need them to be quick drying. Many people swear by Merino Wool shirts, but we just can't justify the hefty price tag when athletic shirts work so well for us. We find that the Russell Athletic Performance T-Shirt is a much less expensive shirt when compared to Merino Wool, and at least for us, it meets all of our needs! Perhaps in the future we'll give Merino Wool a shot. Quick Dry Synthetic Material - Let's us wash them (by hand or machine) and they're dry by the next morning (or sooner in most cases). Stretchy Material - Allows for easy, comfortable movement for all types of activities (e.g. walking, hiking, bending, etc.). Several Pockets - More pockets allow us to store and organize the things we carry with us, especially when we need quick and easy access to specific items. As in added bonus deep pockets are even better. Secure/Zippered Pockets - The harder it is to get into a pocket, the less of a target we are to pickpocketers. Additionally, secured pockets dramatically reduce the probability of us loosing items. Several brands and models of pants met at least 80% of our criteria, however the UB Tech Rainier Travel Chino Pants were a quarter or less of the cost (when compared to the highly praised Eddie Bauer Guide Pro Pant)! Watch our video review of the UB Tech Rainier Travel Chino Pants, compared to the Eddie Bauer Guide Pro Pant. Tip: We took the DIY approach to making our pockets even more secure. Watch our video on Velcro and Hidden Pockets DIY! We walk for pleasure, for health, and for transportation, and on average walk four miles a day, but on occasion exceed fifteen to twenty miles (seriously!). Apart from maintaining good health, weight, and stretching, the shoes we wear are imperative for preventing pain, aches, and injury. 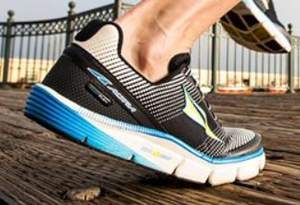 Fortunately for us, Atlra shoes are zero drop, have moderate to ultra-cushioning, and are designed to fit feet, so they have a wide toe box. 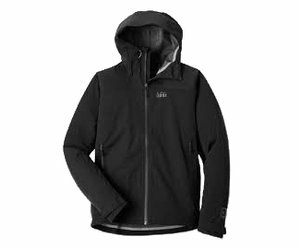 Our goal was to find a light weight-ish jacket that would work in all types of weather since we travel between countries with varying climates. We tried over a dozen jackets of various weights, costs, and features, and eventually settled on the REI Talusphere Rain Jacket as the best for our travel style. The Talusphere has the following as features: waterproof, large pockets, hidden chest pocket, pit-zips, adjustable hood, wrist cuffs, and waist band. At just over a pound it's definitely not 'ultralight', but it's a great value of features and cost, especially if you can buy it for about $80 on sale and with a coupon (which is the deal we got). Watch our video review of the Talusphere Rain Jacket. Tip: When we first got this jacket we didn't appreciate the torso pockets being so high, but as soon as we strapped on our pack we understood that it provides access to them when wearing a hip-belt! Just like our outer layers, our underwear needs to be quick drying and comfortable. The Champion Men's Tech Performance Boxer Brief checks all the boxes; they're comfortable for those days when we sightsee all day, they dry quickly after hand washes, and they have a functional fly. We only pack a couple of shirts, so they need to be comfortable for all of our activities. Plus, since we often hand wash and hang dry, we need them to be quick dry. Many people swear by Merino Wool shirts, but we just can't justify the hefty price tag when athletic shirts work so well for us. We found that the Opna Women's Athletic Shirt is a much less expensive shirt when compared to Merino Wool, and at least for us, it meets all of our needs! Perhaps in the future we'll give Merino Wool a shot. Traveling from country to country means that we're commonly going back and forth between cold and warm weather locations. To still pack light, layering is the key! Also, in colder weather, a long sleeve athletic shirt is perfect for jogging. The Cherokee Women's Infinity Long Sleeve Tee is fast drying when we hand wash, comfortable with an additional layer or two (over or under it), and has thumb holes to keep hands a bit warmer. Tip: You can use the thumb holes to keep the sleeves from riding up when putting on an outer layer. One of Shannon's favorite items! A skort can be dressed up or down as needed and because of the shorts underneath, it's great in all sorts of activities. Plus, the Baleaf Women's Active Athletic Skort has pockets and cabling for your headphones, making it a great functional piece of clothing for travel. We took the DIY approach to making our pockets even more secure. Watch our video on Velcro and Hidden Pockets DIY! Tip: If you already have a skort that doesn't have a pocket on the undershorts, just sew one on yourself. Don't worry about the pocket being perfect, since it's covered by the skirt it wont be seen! Also, if you only have a pocket on one short leg, you can sew a pocket onto the other leg. To save weight and volume on our toiletry containers, we use food pouches! They can be found in the baby food aisle or the yogurt section. Instead of throwing them away after eating the food inside, clean them out and fill them with shampoo, conditioner, sunscreen, or lotion, to name a few. Food pouches are great because the lids tightly screw on and off, they're reusable, weigh about a third of an ounce (super lightweight!) and are collapsible, taking up less and less space as you use the product inside. Just be sure to use a pouch that's 3.4 ounces (100 grams) or less to make sure it's TSA friendly. Watch our video, DIY Travel Liquid Container: Hack for Minimalists! When we initially started long-term travelling we didn't realize how important an antibiotic ointment in our toiletry bag was. When we're out exploring each new city we somehow manage to get small cuts and scrapes more often than while at home. To prevent an infection, which would inevitably slow us down, we use an antibiotic first aid ointment whenever needed. Once we realized the ‘scrubbing’ ingredient in non-plastic/synthetic face scrubs is usually rice flour, we immediately set out to research it further. What we learned was that not only is rice flour a great exfoliate, but it also has acts as an emollient and has anti-inflammatory properties. Additionally, because of the starch contained in rice, it helps control shine by absorbing oil produced by the skin (sebum). We wondered if there was a difference between white and brown rice flower and discovered that both types work, however if you have a choice, choose brown rice flower. White rice flower is stripped of the bran and germ layer, so it’s lost the benefits of having magnesium, iron, vitamins B1 and B3, and the oil contained in the bran. We could have gotten pretty fancy with our creation of a face scrub, but instead decided to keep it simple. We discovered that with a sprinkle of rice flour and a very small amount of soap, you can have a high-end face scrub experience for pennies on the dollar. Plus, it’s easy to travel with! We carry a small amount of rice flour in a zip-lock bag and then use whatever liquid soap we have on hand. This works with bar soap as well; simply coat your face with a bit of soap and then dab your finger in the rice flour, scrub thoroughly, and then rinse. Having a quality lip balm with SPF is important to keep our lips moisturized and protected. This is particularly important when we’re spending full days sightseeing or hiking! We try to find lip balm that’s free of petroleum/petrolatum, mineral oil, phenol, dyes, and other chemicals. While on the road as digital nomads, it’s not always easy to find lip balms that meet our needs, but our go to product is Sun Bum Sunscreen Lip Balm, SPF 30. Healthy skin is extremely important to us, so a good, non-comedogenic (oil-free and won’t clog pores) moisturizer is important. Our go to daytime moisturizer is CeraVe AM Facial Moisturizing Lotion with SPF 30. Our nighttime healthy skin routine includes an application of CeraVe’s PM facial Moisturizing Lotion. We started off with standard travel size containers but found that they were too big, bulky, and heavy for our needs. For liquids and lotions that we need more than an ounce or two of, we use our DIY collapsible pouch solution. However, we still needed something smaller, less bulky, and lighter for gels and lotions that we needed only very small amounts of. We found that the small sample containers they give away for free at makeup counters were perfect! They don't have any fancy packaging and are just the bare minimum amount of plastic to keep the container sealed and functional. You can purchase a set of different sizes on Amazon, or you can ask for a couple at a makeup counter in a department store, YMMV (your mileage may vary). Crystal Salt Deodorant is a natural deodorant that's great for travel since it’s not a gel or liquid. Plus, it works really well! Tip: Like any other deodorant the efficacy of salt deodorant will depend heavily on the strength of your body odor. For the best results, try to apply it at night, after bathing. If you still find that it doesn't work well for you, try applying more of it or applying it twice a day. We both needed a razor and didn't want to carry around a full handle, so we briefly considered cutting our full size handles into more of a travel size length. Fortunately, we found the Gillette Venus Snap Razor that's small enough to make it’s way into our packs! Tip: Sergio actually uses a men’s razor that's about the same size, but it's taken from a lager shaving set, the Gillette Fusion ProGlide Men’s razor Styler, 3-in-1. Menstrual cups take the fuss, waste, and cost out of periods! If you're used to tampons and pads, the idea of a menstrual cup can seem like a non-starter. Give it a chance though, and you may find that you'll refuse to use tampons ever again! Not only are menstrual cups better for your health, but the Diva Cup lasts 10 years, saving you thousands of dollars and dramatically reducing your landfill waste. When traveling, it's fantastic not needing to regularly purchase and constantly carry around bulky feminine products. If you don't want to give up makeup while traveling, then a full-face makeup palette is the key to saving weight and space! We searched for a palette that included all the basics: eye shadow, blush, bronzer, eye brow powder, and highlighter. With the Tarte Rainforest After Dark Colored Clay Eye & Cheek Palette the only other makeup you need is a foundation, mascara, and lipstick. Tip: There's no need to purchase travel specific makeup brushes. We took our standard brushes and cut the handles down to a good travel size with a Dremel. When we saw this we were skeptical, but the positive reviews convinced us to give it a try. The MakeUp Eraser is a polyester towel that with only water removes makeup, even waterproof mascara! This little towel removes all her makeup, so it definitely earns a space in Shannon's bag! We want to capture our memories and have them to look back on for years to come. Of course, there’s a spectrum of cameras to choose from. On one end, you have the camera on your cell phone, and on the other end you have a DSLR (Digital Single Lens Reflex). Using a DSLR camera is extremely tempting, since they take the best images at a quality that will look good for years to come, however the price point is a bit high, and really, they’re bigger and heavier than we’d like to carry. Using only our cell phone camera is also tempting, since we already have them and we'd be adding zero additional gear to our backpack. Unfortunately, let's be honest, the quality of pictures from your cell phone is hit or miss (when compared to a good standalone camera) especially in low light. Since we want our pictures to be high quality, we needed to find something in the sweet-spot, which means looking for a point and shoot camera with a larger sensor (1-inch) and awesome optical zoom (10x). What we found (and love! ), is the Panasonic LUMIX ZS100 Camera. Weighing only 11 ounces, this camera packs a punch with a 10x optical zoom, a wide-angle lens (F/2.8-5.9 aperture, 25mm-250mm), 4K Ultra HD photo and video, and a 20 megapixel sensor. For some examples of images we've captured, check out our Photo Albums. We purchased our camera in 2016 but since then Panasonic has refreshed it and released the LUMIX ZS200. Tip: We use the Panasonic Image App on our phones to gather and add GPS location data to our images. Our needs are unique because we’re mobile consultants who travel out of one bag and need to minimize weight and volume in our backpack, yet can’t sacrifice speed and performance. It’s not unheard for us to run virtual machines, do video and photo editing, and undertake extensive multi-tasking. Therefore, we looked for the best value when it came to cost, features, performance, upgradeability, and weight. All things considered, we ultimately chose the Lenovo ThinkPad T series as our laptop of choice. We purchased our laptops in 2016 so we each carry Lenovo Thinkpad T460s, although if we were buying today we’d by the latest generation! When it comes to a mouse, Logitech is a brand that we’ve come to trust over the years. So, when we were searching for a great mouse to pair with our laptop (our laptop has a track pad and pointer sticker, but it just isn’t efficient for long work sessions) we considered many brands. In the end, it's no surprise that we purchased a Logitech. We wanted something that was lightweight, connected via Bluetooth (we didn’t want to take up a USB port), tracked on most surfaces (including glass), and had multiple programmable buttons. The Logitech MX Anywhere 2S Wireless Mobile Mouse met all of our needs and more! The last thing we wanted to carry was multiple travel adapters for different countries, and while there are many options out there for all-in-one world adapters, we wanted one that was compact and lightweight. The Kikkerland UL03-A Universal Adapter works in over 150 countries, has a compact flat design (unlike cube adapters), and is lightweight (less than 2 ounces!). As if that wasn't enough, you can pick it up for less than $10! Note: This is not a power converter. Keeping our phones charged for extended use is critical. We use our phones constantly while traveling to help us look up information, find directions, work remotely, and so many other things along the way. We’ve never yet had to deal with a dead battery (fingers crossed) because we've always had an external battery pack. The RAVPower Portable Charger External Battery Pack is great because it has a high capacity (67oomAh), recharges quickly, weighs only 4.1 ounces, and has a 2.4 Amp USB port so our phones charge at full speed. Furthermore, it has four LED lights indicating its current charge level, which allows us to see when we’re running low and need to recharge it. Plus, we can easily stash it in our pocket or backpack hip-belt, making it convienient to use! We’re both remote consultants and use our laptops (Lenovo ThinkPad T Series) heavily for work, so having a place for both of us to plug in is critical. Plus, to reach those seemingly all to common and barely out of reach power outlets, we carry a power strip. 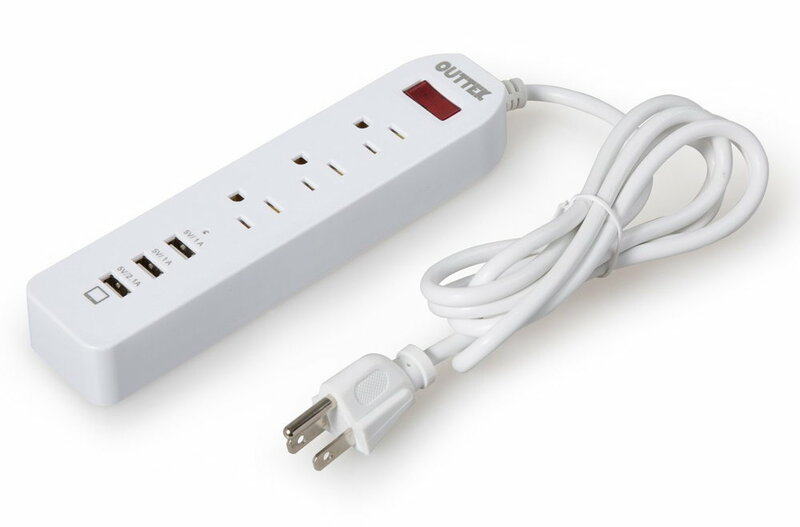 For our usage habits, we found the HiTrends Mini Travel Power Strip to be perfect, because it has space to plug in both laptops, our camera battery charger, and three USB devices (all three USB ports are 2.1 Amps on the newest version). Initially, we wen't back and forth whether we should buy it, but it earned its place in our bag since we needed it before we'd even left the United States (Boston Logan Airport lounge)! We don’t always find two outlets that are available (or next to each other), so being able to both plug our laptops in and charge our small devices into one outlet is incredibly handy. It's incredible to think that a storage device roughly the size of the nail of your thumb and weighing a quarter of an ounce can carry 128GB’s of encrypted data! We’ve found that the Samsung 128GB USB 3.0 Flash Drive Fit is critical in allowing us to quickly and securely move data among us and to print out boarding passes (Ryan Air for example) from print shops. The one downside is that it doesn't have a write protect switch. Sergio only uses Samsung SSDs in our own computers and in his client's computers because of their legendary reliability. So what better card for our camera than a Samsung? We've taken tens of thousands of pictures with our camera and to this day our Samsung Micro SDXC Card operates like the first day we installed it (knock on wood!). Naturally, we bought two to have a backup while on the move! Finding the right pack for your needs is critical, as your bag becomes your closest thing to home when you’re doing long-term travel. We had a list of 'must haves', 'like to haves', and 'deal breakers' that we used to evaluate dozens of bags and ultimately to find our winner, the Osprey Manta AG 36 Backpack. To learn more about this bag, and the others we considered check out Finding The Travel Backpack We Call Home and our backpack reviews on YouTube. We use our daypacks so much more than we ever imagined! Rather than lug around our main packs everywhere we go, we use these daypacks when we’re staying in one place and going out for the day. They’re small enough that we’ve never been turned away from an attraction for having too large of a bag, but they’re still large enough to help us carry groceries, our camera, and a jacket. The reason we chose the HIKPRO Lightweight Daypack is because they fold easily into a small pouch that we can stash in our main pack and have a five year warranty! Most of our travel is in urban and metro areas, so we want to keep our backpacks as secure as we can. We outfitted our bag with DIY Lockable Zippers and subsequently added locks in an effort to deter thieves. We opted for locks that were small and had a combo, so that we wouldn't have to worry about keeping track of a key. Plus, since we have to pass through airport security, we made sure the locks weren't only TSA approved, but also had ‘SearchAlert’, meaning that the locks indicate when they’ve been opened by TSA. We opted for Tarriss TSA Locks with SearchAlert and have been happy with them. While small, we've even used these locks to secure our bags to the frame of a bed in an AirBnB that didn't have a lock on our bedroom door! Since we only pack a few changes of clothes and use our gear day-in and day-out, our stuff tends to wear more quickly because we use it so much more. We’ve used the kit for sewing seems, hems, buttons, tears, etc. and it’s definitely helped make our stuff last longer. You’ll be surprised how often you’ll be grateful for packing a sewing kit! Tip: It’s easy to make your own sewing kit! You can use supplies you already have and buy only what you need. Thread: We carry one light and one dark color thread that we wrap around a small piece of cardboard (or you can use stock paper). We cut the cardboard with a half quarter of an inch slit/indentation for each thread so it stays in place. In addition, cut a small slit to slide the loose end of the thread so it'll stay secure wrapped around the cardboard. Scissors: If you don’t have travel size scissors (usually about 3-4 inches), try foldable scissors. There are two main styles to choose from, style one and style two. Safety: For sharp ends (needles and non-foldable scissors), stick them in a small piece of foam to keep them from damaging anything. We actually use a foam earplug. Safety Pins: Include a couple of safety pins. They’re perfect for holding a tear, ripped seam, or a loose button (or two sides of a shirt together if your button falls off) in place until you have time to sew it. Duct Tape: For non-sewing repairs pack a few feet of duct tape, but don’t carry a large roll! Instead, wrap a few feet, around a small pencil, or even around a squished toilet paper roll. Optional supplies (although we don’t carry these): Extra buttons, needle threader, thimble, seam ripper, measuring tape, and/or pins. You either love or hate packing cubes! We find that they’re a fantastic way to organize our belongings, especially because we pack everything into only one bag (Osprey Manta AG 36 Backpacks). Instead of spending a pretty penny on Eagle Creek or even the less expensive Uncharted brand of packing cubes, we made our own set of 10 for under a couple of dollars! Read about it here and see our tutorial on YouTube. When you're living out of 'OneBag' space and weight are at a premium, so pack items that are mult-purpose or all-in-one. For example, we pack a travel power strip that has a six-foot cable that gives us plenty of length, a surge protector that keeps our electronics safer, and it has the ability for both of us to be plugged into one wall outlet. Plus, we can plug in our camera battery charger at the same time, and to top it off, we can charge up to three USB devices! When embarking on long-term travel there's no need to spend hundreds or thousands of dollars on new gear (think merino wool and 'tech' fabrics)! Yes, sometimes those things are worth it, but often times much of what you have will work just fine. Plus, when it wears out, you can re-evaluate if an upgrade or different item is needed and worth the additional cost. Also, don't forget to evaluate if you really need the item to begin with. When purchasing new gear we use the 80/20 principle. We ask, what can we spend 20% of the cost on to get 80% of the performance? In other words, there's an intersecting point where cost and performance meet, the 'sweet spot' if you will. Go below that point, and you're saving money but getting less performance out of the product. Go above that point, and your spending a lot more money but getting a very minimal performance increase, relative to what you're spending. So, we don't need the best of the best, but we also don't want the bottom of the barrel. We find that under 40º Fahrenheit/4.5º Celsius (+/- a few degrees and considering humidity and wind chill) layering with shirts and our jacket isn't enough. Instead of packing heavier gear and caring it with us while traveling, we purchase warmer gear when we need it and then donate it when we no longer have a use for it. We’ve found second-hand and thrift shops (sometimes also called charity shops) are great places to find inexpensive and used warm jackets, sweaters, and scarves. Discount stores like Primark or T.K. Maxx in Europe, or Ross in the US, are great places to find inexpensive and new beanies, gloves, and thermals. We've even found touch sensitive tipped gloves at the dollar store (Pound shops in the UK), which are thin, but a helpful layer under a warmer glove when you need to use your phone for directions. If you can easily purchase an item on the road, avoid packing it, or at least limit how much of it you pack. We pack only a couple weeks worth of re-usable items (e.g. toiletries) and then purchase more when we arrive/need more. Budget airlines often have small overhead bin areas. When flying, we're always careful to pack our bag to minimize depth, allowing us to more easily place our packs in the overhead bin space. As an added tip, be sure to treat airline employees (and of course everyone else) with respect, as they hold the power of enforcing carry-on luggage fees. We've been witness to plenty of 'rude' people having to pay for their bags, even though their bags seemed to be smaller than ours. Pack less and wash more often. You can wash clothing by hand in the sink, in a Scrubba Wash Bag (or go DIY with a two-gallon Ziploc bag), or in the shower. We find that washing every day or every other day is much easier and less daunting than hand-washing several days of clothing at once. You'll be amazed at how little you actually need once you're on the road! See our process of how we minimized our belongings before leaving home and how we realized how much less we needed to thrive and be happy as digital nomads once we were on the road, in our three-part series, Getting Rid of Our Stuff. Plus, we show you how we removed over five pounds apiece from our backpacks over the first few months of our long-term travel and digital nomad life.